To make the heart: Take a thumb sized piece of fimo and warm between your palms for pliability. Roll into a ball, then on a flat surface roll into a sausage measuring 10” in length. Cut in half, lie side by side and then twist one pair of ends around each other. Bend the sections into heart shape and then twist the remaining pair of ends around each other. Bake as per packaging instructions. Mount three brads in a even spaced line down the left hand edge of the purple piece. Glue this to the front of the card. Adhere the pink piece along the bottom edge of the purple piece, then cover the join of these two pieces with the lace. Using wet glue dots, attach the pearl strand across the lace. 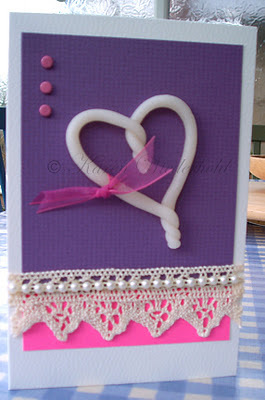 Tie a ribbon around the heart and glue this to the card with super glue.